Our Daily Summaries are handy if you want to keep track of how much your team is spending day to day in AWS, and how that's changing over time. The dollar amounts that we report on in these summaries is based on how much you used - not how much was actually charged to your bill. 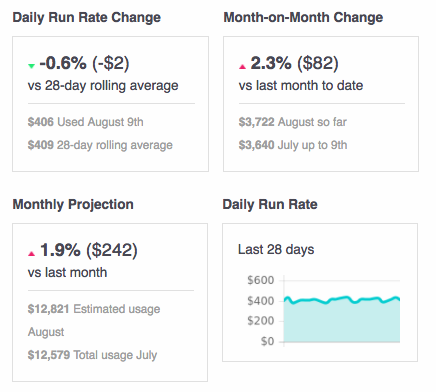 This is so you can keep track of your actual AWS usage run rate, which is the metric that most people in an organisation can actually influence. If you want a full picture of how much was spent, including one-off costs like Reservations or Tax, head to the Cost page in Stax, and turn on the Financial Filters. Having a default view setup in Stax will make these summaries even more useful, as you'll only get a report for the data that you care about. If you want a different default view for different alerts, contact us with the details!